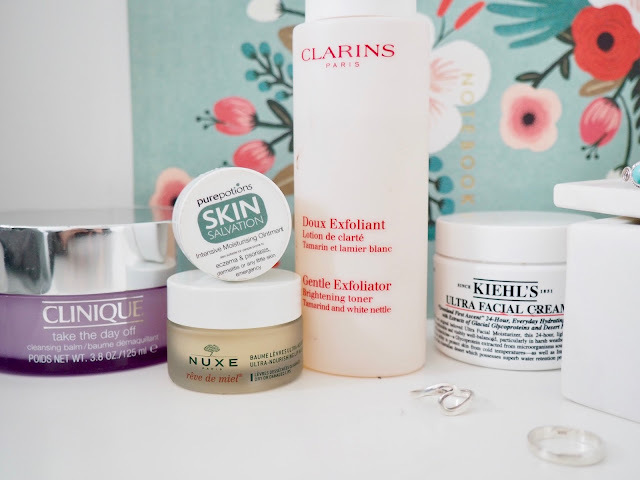 When it gets to around 9:30 I'm thinking about how quickly I can dive under the covers and grasp that 7-8 hours sleep, so when it comes to a nightly skincare routine I like to keep it simple and quick. 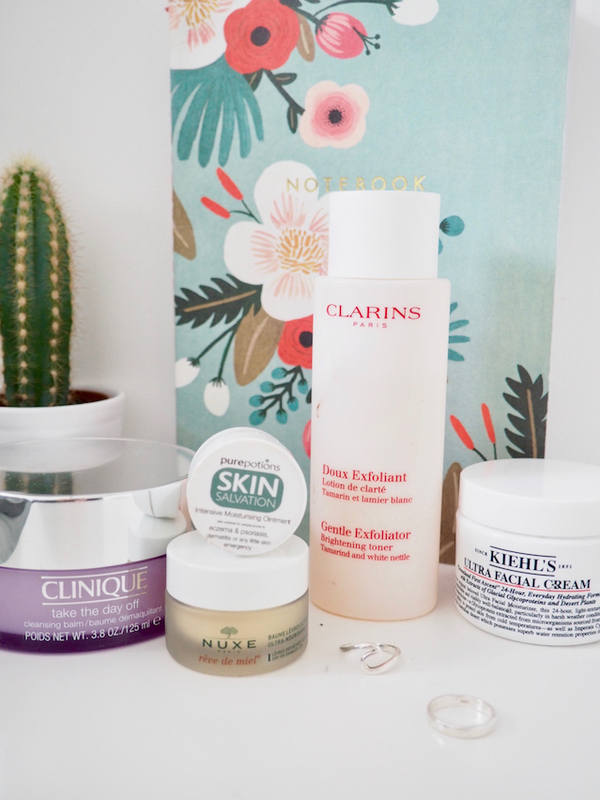 So in 5 easy steps I'm fresh faced and moisturised ready to hopefully full into that deep slumber. Clinique take the day off: This balm works so well on my skin, you only need a small amount as it melts as you work it into your face, I really feel refreshed and cleansed after applying this, if I've worn make up that day it really does take it all off and doesn't leave your face feeling greasy or like there is product still covering your face. Clarins Doux Exfoliant: As a previously mentioned in my morning routine due to being on placement and also it being pretty gloomy in England this time of year I really like products that help brighten my skin and so this really caught my attention, it helps stop the build up of dead cells instead of having to use an exfoliator often and it leaves my skin soft and smooth ready for the final few steps to my routine. Pure Potions Intensive Moistrising Ointment and Nuxe Reve de Miel: I previously mentioned these in my morning skincare routine but actually carry these items with me into my evening routine as they work wonders, Nuxe works wonders for my lips and the ointment works wonders for around my nose, applied daily and nightly I never have trouble with either parts of my face! Khiels Ultra Facial Cream: Ok so I know this advertised for daily use and I use it as a night cream, but A that's because I don't own a night cream yet (so any good/affordable recommendations send them my way!) and B I like to use it at night as it's light and absorbs super quick so no greasy feeling between face and pillow and I just like to treat my skin ay night time to a good moisturiser, in the few times I have used it in the morning though it really does work wonders throughout the day! Plus I am just so excited that I have finally purchased my first Khiels product! I'm still lusting after the night serum, so that might be my big splurge this year. What products do you use for your evening routine?